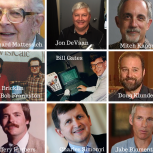 30 Years of Excel – the Story of Excellence! Аn autumn day in late 1984 four people gather in the small apartment of Red Lion Hotel in Bellevue, near Seattle. The purpose of the meeting is to lay the foundations of a secret project codenamed "Odyssey." For three days they plan, draw, program, write code and discuss hard to clarify the concept of creation and development of new software, which a couple of years later would change the business world, and will bring them millions of dollars.